Amazon Web Services towers above other global infrastructure providers in terms of the quality and breadth of its offerings, according to the research firm's latest calculations. 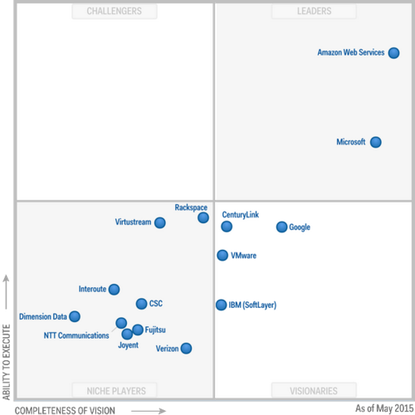 Only Microsoft's Azure nears the AWS juggernaut status in the boxy Gartner universe. Other established players, such as Google, IBM, VMware, Verizon and CSC, are all huddled far further down within the lower quarters. A few enterprise providers, HP and Oracle notably, aren't in the box at all. Of course, Gartner's Magic Quadrant is viewed with cynicism by many in the IT industry. The Magic Quadrant is a simple four-part matrix designed to chart how broad a vendor's offering is against how well it actually works, comparing this ranking with all the competing offerings. Like any simplifying visual heuristic, the quadrant glosses over complex areas of technology and could be skewed by analysts' subjectivity. But it's good for helping IT managers who need to learn who's who in a given technology space, and it provides fodder for the marketers whose companies land in the winning sector. The AWS service is suitable for "all use cases that run well in a virtualized environment," including "highly complex enterprise applications," write report authors Lydia Leong, Douglas Toombs, and Bob Gill. AWS has over 10 times more cloud IaaS compute capacity in use than all the other 14 providers listed in the quadrant combined. Who would have guessed that 10 years ago, an online book seller would lead the pack in offering IT infrastructure? This lead is growing, too: Last year, AWS only had 5 times as much compute capacity as these other players. The analysts weren't completely enamored with AWS. AWS can be complex to manage, and large workloads benefit from third-party management tools and services, such as those offered by RightScale or Cloudability. They are also concerned that the company has too many irons in the fire. Some of the less widely used offerings may not get the continued attention they'll need down the road. What of the other contenders? Microsoft's Azure comes close to AWS, but customers have complained of too many outages, leading Gartner to advise those running critical applications on Azure to have non-Azure backups. That said, Azure comes closest to AWS in terms of offering the breadth and depth of infrastructure services. Of Google, Gartner notes that while the company may have some boss technologies, it is still in "the rudimentary stages of learning to engage with enterprise and midmarket customers." Shade! Elsewhere, Rackspace is still too focused on developers, and Verizon offers basic infrastructure services, though needs more "value-added" features. But what about IBM? IBM is progressing with the technologies from its purchase of SoftLayer last year for $2 billion. The SoftLayer offerings still aren't integrated smoothly into IBM's BlueMix set of platform services. Also, SoftLayer's unique set of API's for managing cloud workloads is still not widely supported by third-party management tools. IBM has been addressing this last deficiency. Earlier this week, the company started offering the Open Stack cloud hosting software on SoftLayer, offering a way, in theory at least, to use the open-source software to manage workloads running on IBM's infrastructure clouds. Gartner hasn't been the only company inspecting the cloud providers this week. RightScale, which offers a set of cloud service management tools, analyzed Google's latest rounds of cloud price cuts and found them to compare favorably to AWS pricing. AWS has been backing off from the price wars lately, preferring to compete on features instead, noted the report's author, RightScale vice president of marketing, Kim Weins. "It would be surprising if AWS didn't announce price cuts sometime in 2015, but it's yet to be seen whether the company will try to undercut Google prices or go for a 'close enough' strategy. At some point, Google's price advantages may cause more cloud users to sit up and take notice," Weins wrote.